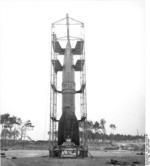 26 May 1943 At Peenemünde, Germany, before Hermann Göring, Erhard Milch, and other top German leaders, an A-4 rocket and a flying bomb were tested. The A-4 rocket flew perfectly, while the flying bomb crashed only after a mile or two of flight. 22 Jun 1943 60 British Lancaster bombers attacked factories at Friedrichshafen in southern Germany. Planners of the attack though they were conducting a strike on a factory producing radar parts, but in actuality it was manufacturing parts for V-2 rockets. 13 Aug 1943 US 9th Air Force bombed the Messerschmitt factory at Wiener Neustadt, Austria. Planners of the attack thought they were conducting a strike on a factory producing fighter aircraft, but in actuality it was manufacturing parts for V-2 rockets. 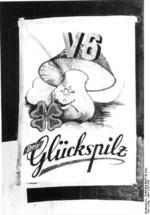 26 Aug 1943 Albert Speer called a meeting with Hans Kammler, Walter Dornberger, Gerhard Degenkolb, and Karl Otto Saur to negotiate the move of V-2 (A-4) rocket main production from Peenemünde Army Research Center on the Baltic Sea coast to an underground factory in the Harz mountains deeper inland. 18 Jun 1944 British No. 617 Squadron attacked the 20-foot thick concrete dome containing V-2 rockets at Wizernes, France without success. They would return to this target on multiple occasions in the following month. 24 Jun 1944 British No. 617 Squadron attacked the 20-foot thick concrete dome containing V-2 rockets at Wizernes, France with "Tallboy" bombs. 25 Jun 1944 British No. 617 Squadron attacked the German V-2 store at Siracourt, France with 17 Lancaster, two Mosquito, and a Mustang (a gift from the USAAF) aircraft; the Mustang fighter was flown by Leonard Cheshire and used as a low-level marker aircraft. 25 Jul 1944 An unarmed RAF Dakota aircraft took off from Italy for Zaborów, Poland, where it would pick up V-2 rocket parts captured by Polish partisan fighters. 8 Aug 1944 German SS Lieutenant General Hans Kammler was named the Special Commissioner for the A-4 rocket program. 2 Sep 1944 The German V-2 weapon was declared operational. 7 Sep 1944 The first two German V-2 rockets were fired against the Allies by German 444 and 485 Mobile Artillery Detachments at 1030 and 1140 hours, respectively. They both targeted Paris, France, but both crashed immediately after launch. 8 Sep 1944 The third German V-2 rocket fired in anger became the first to successfully hit the intended target, hitting an area in the suburbs of Paris, France. The fourth and fifth rockets, aimed at London, England, United Kingdom, also found their targets. The fourth rocket fired at 1738 hours London time or 1838 hours German time landed in the Borough of Chiswick at 1843 hours London time; it landed on Staveley Road, collapsed three houses, killed 3 civilians and 1 off-duty Royal Engineers soldier, and made a crater 40 feet wide and between 10 and 20 feet deep. The fifth rocket landed 16 seconds later in Epping, which was 18 miles northeast of Whitehall and 20 miles from Chiswick; this rocket destroyed some wodden huts and made a crater 30 feet wide and 16 feet deep. The British government censored all these incidents in fear of potential demoralizing effects. 12 Sep 1944 One of the four German V-2 rockets launched on this date hit Chrysler vehicle works in Mortlake Road, Kew, southwestern London, England, United Kingdom. 8 were killed, 14 were wounded, and property damage was significant. 13 Sep 1944 One German V-2 rocket hit Britain. 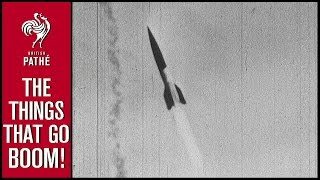 14 Sep 1944 Three German V-2 rockets hit Britain. One of them hit the center of Walthamstow, London, England, United Kingdom at 0455 hours, killing six immediately and another one later from wounds. The resulting crater was 50 feet wide and 10 feet deep. 3 Oct 1944 A German V-2 rocket hit the Hellesdon Golf Course near Norwich, England, United Kingdom at 1950 hours, injuring 1 person and damaging a glasshouse, 5 farm buildings/barns, several haystacks, and 1 acre of sugar beet. 4 Oct 1944 A German V-2 rocket hit Rockland St Mary 6 miles southeast of Norwich, England, United Kingdom. It hit the village school directly, injuring 2 adults and 34 children, and the blast damaged 23 houses nearby. It was the worst attack on the Norwich region during the war. 5 Oct 1944 A German V-2 rocket hit Acle near Norwich, England, United Kingdom, temporarily causing blockage to a road. Another rocket hit Surlingham, downing several telephone lines. 6 Oct 1944 A German V-2 rocket hit Shotesham All Saints 5 miles south of Norwich, England, United Kingdom, slightly injuring 1 person while damaging 20 houses, 1 church, and 1 school. 11 Oct 1944 A German V-2 rocket hit Rockland St Mary 6 miles southeast of Norwich, England, United Kingdom, which was the second rocket to hit the village during the war (first being on 4 Oct 1944). It damaged 14 houses. 12 Oct 1944 A German V-2 rocket hit Ingworth 14 miles north of Norwich, England, United Kingdom, slightly injuring 2 people and causing damage to 20 houses and 1 school. This rocket was the 28th rocket to hit the Norwich region, and was to be the last of the current rocket campaign against Norwich. None of the 28 rockets targeted at this area killed anyone, and property damage was relatively light. 12 Oct 1944 The German 485 Mobile Artillery Detachment, responsible for launching V-2 rockets, began their move from Friesland to the Hague in the Netherlands. On the same day, Adolf Hitler ordered that London, England, United Kingdom was to be the only target for V-2 rockets in Britain; attacks on other continental cities such as Antwerp were to continue. 15 Oct 1944 German V-2 rocket hit Rettendon, Essex, England, United Kingdom. The village pub was damaged and two were slightly injured. 20 Oct 1944 German V-2 rocket hit Croydon, London, England, United Kingdom, killing 6 and seriously injuring 14. 22 Oct 1944 The German 485 Mobile Artillery Detachment, responsible for launching V-2 rockets, arrived at the Hague, the Netherlands. It immediately began to set up their equipment for a renewed rocket campaign against London, England, United Kingdom. 26 Oct 1944 A German V-2 rocket hit Palmers Green Station in North London, England, United Kingdom at 1845 hours; detonating next to a stationary train, it seriously injured 15 people, while 38 suffered minor injuries. Elsewhere, another rocket hit Ilford, London, killing 8, seriously injuring 15, and lightly injuring 20. 29 Oct 1944 German V-2 rocket hit the Beckton Gas Works in London, England, United Kingdom. 30 Oct 1944 German V-2 rocket hit the Royal Victoria Dock at Earlham Grove, West Ham, London, England, United Kingdom at 1200 hours. 31 Oct 1944 A German V-2 rocket hit Swedish Yard of Surrey Commercial Docks in Bermondsey, London at 0256 hours, damaging several wheat containers. Another rocket hit the Royal Victoria Dock at Earlham Grove, West Ham in the afternoon. 1 Nov 1944 A German V-2 rocket hit Eglington Road in Woolwich, London, England, United Kingdom at 0210 hours, killing 7 people. At 0510 hours, another rocket hit Friern Road in Camberwell, London, killing 24 and injuring 17. A third rocket hit Shardeloes Road in Deptford, London at 1830 hours, killing 31, seriously injuring 62, and lightly injuring 90. Two other rockets hit London that day, though causing little damage. 2 Nov 1944 Four German V-2 rockets hit London, England, United Kingdom on this date. One of them hit outside of a mental hospital at Banstead, killing 3 and seriously injuring 11. Another hit Deptford, killing 31. 4 Nov 1944 German V-2 rocket hit the golf course at Ilford, London, England, United Kingdom without causing any injuries. 5 Nov 1944 A German V-2 rocket hit Collier Row in Essex County near London (now a part of London), England, United Kingdom at 0035 hours. Another rocket hit Penhurst, Kent, southern England at 0130 hours. At 0745, a third rocket hit Tooting Bec Common in southwest London. A fourth rocket hit an iron bridge in Southwark Park Road, Bermundsey, London at 1045 hours, damaging 250 feet of railway. At 1713 hours, yet another rocket hit Grovedale Road, Islington, London, killing 31 and seriously injuring 84. 6 Nov 1944 A German V-2 rocket fired from the Hague, the Netherlands intended for London, England, United Kingdom went astray, hitting Biscot Road, Luton 32 miles north of London instead. It killed 19 people and injured 196, while destroying 17 houses and damaging 1,500 others. 8 Nov 1944 At 1419 hours, German radio revealed the on-going V-2 rocket campaign against Britain to the world for the first time. The message was picked up by the BBC in Britain shortly after. 10 Nov 1944 British government lifted the ban on reporting rocket attacks on Britain after Prime Minister Churchill announced to the Parliament that British cities had been under rocket attack "for the last few weeks"; German V-2 rocket attacks had in fact started on 8 Sep 1944, or more than two months prior to Churchill's announcement. On the same day, a V-2 rocket hit Goulson Street in Stepney, London, England United Kingdom, killing 19, seriously injuring 97, and lightly injuring 323. 11 Nov 1944 German V-2 rocket hit Shooters Hill, London, England, United Kingdom at 1830 hours, killing 24. 12 Nov 1944 German V-2 rocket hit the Bromley Gas Works in West Ham, London, England, United Kingdom. 16 Nov 1944 German V-2 rocket hit Collier Row in Romford, Essex, England, United Kingdom, killing 12 and injuring 32. 19 Nov 1944 German V-2 rocket hit a car park at Southborough Lane, Bromley in southeast London, England, United Kingdom, across from a crowded pub, at 2115 hours. 23 were killed and 63 were injured. 22 Nov 1944 German V-2 rocket hit Totty Street, Bethnal Green in the East End of London, England, United Kingdom. 25 were killed and 44 were injured. 24 Nov 1944 German V-2 rocket hit McCullum Road, Poplar in East End of London, England, United Kingdom at 2030 hours. 18 were killed and 53 were injured. 25 Nov 1944 A German V-2 rocket hit near the intersection of High Holborn and Chancery Lane, Holborn, London, England, United Kingdom at 1115 hours, killing 6 and injuring 292. At 1225 hours, another V-2 rocket hit across the street from the Woolworths store in Deptford, London, destroying the store and many nearby building, killing 160 and injuring 199 (77 seriously). 26 Nov 1944 A German V-2 rocket hits a Woolworth's shop on New Cross High Street, London, England, United Kingdom, killing 168 shoppers. 26 Nov 1944 Germany began V-1 and V-2 rocket attacks on Antwerp, Belgium. 27 Nov 1944 A V-2 rocket impacted on Teniers Square, Antwerp, Belgium, as an Allied military convoy was passing through. The explosion killed 157 persons, including 29 Allied soldiers. 30 Nov 1944 German V-2 rocket at Shooters Hill, London, England, United Kingdom at 0100 hours, killing 23. 7 Dec 1944 German V-2 rocket hit Canley Road in Hackney, London, England, United Kingdom. 19 Dec 1944 German V-2 rocket hit Chelmsford, Essex, England, United Kingdom at 0130 hours. The war factory was hit, killing 39 and seriously injuring 33. 22 Dec 1944 German V-2 rocket hit Chelmsford, Essex, England, United Kingdom, seriously injuring one person. 26 Dec 1944 German V-2 rocket hit Islington, London, England, United Kingdom at 2126 hours, killing 68 and seriously injuring 99. The rocket left two craters, one 40 feet wide and 12 feet deep, the other 10 feet wide and 4 feet deep. 29 Dec 1944 German V-2 rocket hit a house on Croham Valley Road, Croydon, London, England, United Kingdom, killing all occupants. 31 Dec 1944 German V-2 rocket hit near the intersection of Stroud Green Road and Stapledon Hall Road in Crouch Hill, London, England, United Kingdom at 2340 hours, killing 15 and seriously injuring 34. 15 homes were destroyed by this attack. This rocket was the 382nd, and the last, rocket to hit England in 1944. 3 Jan 1945 German V-2 rocket hit the Royal Hospital in Chelsea, London, England, United Kingdom at 0850 hours, killing 5 and injuring 19. 4 Jan 1945 German V-2 rocket hit Woodland Street in Hackney, London, England, United Kingdom. 5 Jan 1945 German V-2 rocket hit the golf course at Croydon, London, England, United Kingdom, making a crater 40 feet wide. 8 Jan 1945 German V-2 rocket hit the junction of LMS and Met. railway lines behind 114 Iverson Road between West End Lane and Kilburn High Road in Hampstead, London, England, United Kingdom at 1630 hours. 2 were killed, 64 seriously injured, and 57 lightly injured. The rocket destroyed 14 houses, badly damaged 152 houses, and lightly damaged 1,600 houses. 12 Jan 1945 German V-2 rocket hit a row of cottages in Ilford, London, England, United Kingdom. 17 were killed and 60 were injured. 13 Jan 1945 German V-2 rocket hit West Ham, London, England, United Kingdom, destroying two trolley buses. 15 were killed and 35 were injured. 15 Jan 1945 German V-2 rocket hit Rainham, London, England, United Kingdom at about 2345, killing 14 and seriously injuring 4. 19 Jan 1945 German V-2 rocket hit Town Quay, Barking, London, England, United Kingdom at 2300 hours. 20 Jan 1945 Three German V-2 rocket hit London, England, United Kingdom. The first hit Potters Bar at 1100 hours, killing 21. The second hit Calton Road in East Barnet at 1315 hours, killing 12. The third hit Tottenham at 2000 hours, killing 23. 26 Jan 1945 An air burst from a German V-2 rocket over Cotswold Gardens, London, England, United Kingdom caused widespread damage. Another rocket hit Clapham, London at 1045 hours, seriously injuring 25 and lightly injuring 42. Another rocket hit Croydon, London in an open space without causing any injuries. 27 Jan 1945 German V-2 rocket hit the Royal Arsenal in Woolwich in southeastern London, United Kingdom at 2230 hours, killing 6 and injuring 17, causing some damage to machines. 2 Feb 1945 German V-2 rocket hit Deptford, London, England, United Kingdom, killing 24. 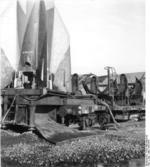 7 Feb 1945 German V-2 rocket hit the railway sidings near Barking Marches, London, England, United Kingdom. 8 Feb 1945 German V-2 rocket hit the Super Cinema in Ilford, London, England, United Kingdom at 1245 hours; 13 were killed and 64 were seriously injured, and 86 were lightly injured. Another rocket hit Tavistock Place in St Pancras, London at 1608 hours; 31 were killed and 54 were seriously injured; the Central London Opthalmic Hospital and the Medical School of the Royal Free Hospital were damaged. 10 Feb 1945 German V-2 rocket hit Silvertown in North Woolwich, London, England, United Kingdom just across the River Thames from the Harland and Wolff shipyard offices; many workers at Harland and Wolff were injured. Another rocket scored a direct hit on the Bascule Bridge in Woolwich at 1115 hours. 11 Feb 1945 German V-2 rocket hit the Glyco Works in West Ham, London, England, United Kingdom. 14 Feb 1945 German V-2 rocket hit the Chelmsford-to-London Road near the village of Mountnessing in Essex, England, United Kingdom at 1700 hours. 14 Feb 1945 German V-2 rocket hit Wormholt Road in Kensington, London, England, United Kingdom about 1 mile west of Sheperds Bush at 2200 hours, killing 29 and injuring 41. 16 Feb 1945 German V-2 rocket hit Crownford Road in Leyton, London, England, United Kingdom at 2345 hours, killing 25 and seriously injuring 10. 19 Feb 1945 German V-2 rocket hit Bawn's factory at Blackhorse Lane in Walthamstow, London, England, United Kingdom at 1420 hours. It wrecked 12 houses, damaged 500 houses, killed 18, seriously injured 53, and lightly injured 150. 20 Feb 1945 German V-2 rocket hit a factory Ilford, London, England, United Kingdom, killing 7 and injuring 94. 26 Feb 1945 German V-2 rocket hit the Northern Outfall Sewer in West Ham, London, England, United Kingdom at night. 27 Feb 1945 German V-2 rocket hit the Royal Albert Dock in London, England, United Kingdom in the morning. 6 Mar 1945 A German V-2 rocket hit Raveningham 13 miles southeast of Norwich, England, United Kingdom, causing little harm. It was the last rocket to hit the Norwich area in the war. 7 Mar 1945 German V-2 rocket hit Trundleys Road at Folkestone Gardens, London, England, United Kingdom at 0300 hours, killing 52 and seriously injuring 32. Two blocks of homes were destroyed. 11 Mar 1945 The first unexploded V-2 rocket landed in England, United Kingdom, but it was not retrieved and studied until 7 Apr, by that time other unexploded rockets had been found and many secrets of the rocket had already been uncovered. 15 Mar 1945 Two German V-2 rockets fell in the River Thames near the Ford factory in Dagenham, London, England, United Kingdom, causing no injuries. 16 Mar 1945 German V-2 rocket hit at Albert Road in Leyton, London, England, United Kingdom at 0638 hours, killing 23 and seriously injuring 18. Another rocket hit Willesden near Hampstead, London at 0230 hours, damaging 200 houses. 17 Mar 1945 German V-2 rocket hit 212 Finchley Road near Borough Central Library in Hampstead, London, England, United Kingdom. Aside from the library, 1,000 homes, the telephone exchange, the lighting station, Council's Work Depot, Warden's Post No. 16, and Women's Vountary Service offices were damaged. Another rocket hit the Rippleway sidings in Barking, London at 2230 hours. 18 Mar 1945 German V-2 rocket hit the Speaker's Corner at the edge of Hyde Park in London, England, United Kingdom at 0930 hours, killing 3 and seriously injuring 9. 21 Mar 1945 German V-2 rocket hit the Packard factory in London, England, United Kingdom at 0939 hours, destroying it and damaging 13 factories and 662 houses; it killed 32, seriously injured 100, and lightly injured 460. Another rocket hit Primrose Hill in St Pancras (though officially listed as in Hampstead), London, damaging the reservoir and injuring 14 people. 25 Mar 1945 German V-2 rocket hit Whitfield Street in St Pancras, London, England, United Kingdom in the late afternoon, killing 9 and seriously injuring 46. The Whitfield Memorial Chapel at Tottenham Court Road was badly damaged. In the evening, at 2300 hours, another rocket hit Broadfield Square in Enfield, London, killing 7 and seriously injuring 100. 26 Mar 1945 Two German V-2 rockets hit Romford, Essex, England, United Kingdom. The first struck Forest Road, destroying 16 buildings and killing 2. The second rocket destroyed one building named "Victory Hut" at Nook Hill. 27 Mar 1945 German V-2 rocket hit Ilford, London, England, United Kingdom. It was to be the last rocket to strike this suburban district of London. To date, 117 Ilford residents were killed by rockets, while 349 were seriously injured. A second V-2 rocket hit Hughes Mansions, Stepney, London, killing 134 and injuring 49. 24 Oct 1946 A Devry 35-millimeter movie camera attached to a V2 rocket took the first photograph from space at the altitude of 65 miles. The rocket was captured in Germany in 1945, and was launched by the US Army at the White Sands Missile Range in New Mexico, United States.